Cruise the Custom Car Gallery! View more Custom Car Videos! Sign up for the latest news! Enjoy contests, site updates and offers! 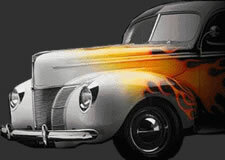 BumpStop.com - The Coolest Rides on the Net! Welcome to BumpStop.com! The Coolest Rides on Net! This site was created for the love of cars, by and for, car enthusiasts! Metal coffins, hunks of metal, rolling sculptures, and magic carpets rides. We believe cars become members of the family, mechanical pets. We give them names, we preen them in our driveways, curse them when they fail and lament their passing at trade-in time. These cars are extraordinary and that's REALLY what the BumpStop is all about! Cruise around! BumpStop is cruisin' FaceBook and Twitter! WE WANT YOUR RIDE! Win a FREE T-Shirt, upload your ride to the Gallery! Don't forget to take our Survey! Automotive News and Articles - updated daily! Lambo Doors - Doors that open like a Lamborghini. These doors pivot forward instead of opening like gull-wing style doors. WhatAPlate.com - The coolest vanity license plates!